The rehearsal process was actually very enjoyable. We would sing through the sheet music and add harmonies if Anita or ourselves felt it needed something extra. This license to interpret the music was part of what made it fun. The other element was the occasion itself. We had to sneak into the manor house through a side door so as not to bring any attention to ourselves and spoil the surprise. 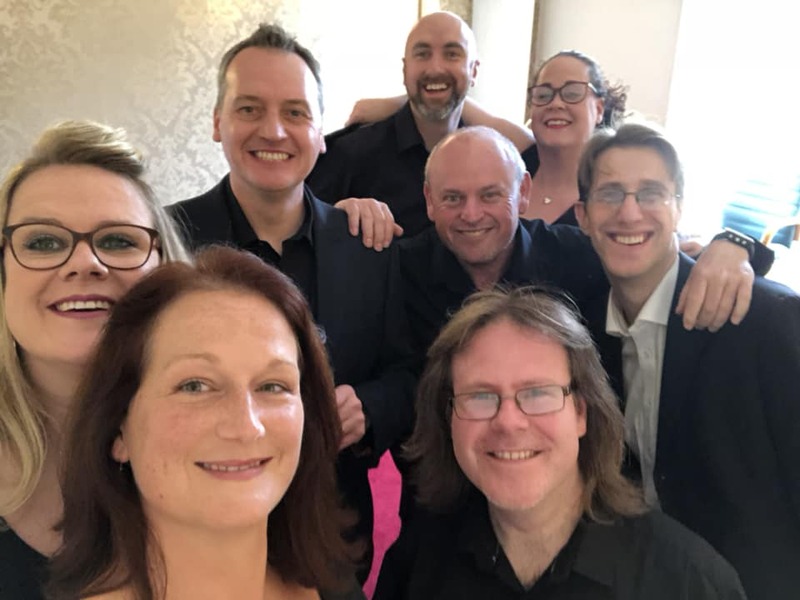 The group of TITCo performers at Anita’s wedding, including guitarist Darren Hunt (below, right). Photo courtesy of Mari Webster. The performance itself went very well. As Anita and her partner proceeded up the aisle, Darren who was perched above the congregation on the balcony started playing the Alice in Chains track. We were tucked out of sight on the opposite side from Darren and as we started singing, we slowly crept into view. Looking down at the audience, it was a delight to see how genuinely surprised they were! As for the performance, I think we were a marmite option. The older members especially did not seem enthused to be listening to this choral rock anthem, but there were wide grins from some of the younger members. We sang Ozzy Osbourne’s Fire in the Sky during the signing of the wedding register. Some lovely moments for us as singers and it was fun to watch Darren rock out during the lengthy and technically fiendish guitar solo. 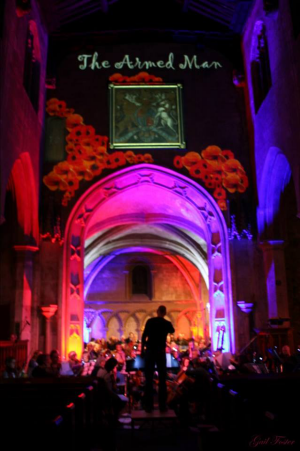 The other concert I was involved in was Karl Jenkin’s Armed Man, 100 years after the World War I armistice finally ended four years of fighting. 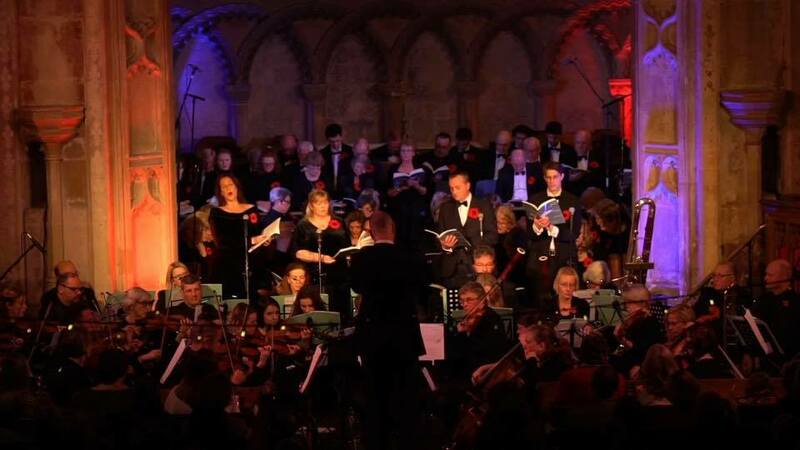 This concert was the vision of conductor Anthony Brown and his partner Jemma Brown who brought together 80 singers from three local choirs as well as 40 musicians. It also included spectacular lighting and projected onto the archway of St Mary’s Church were the names of all the men from Devizes who had lost their lives during the war. In the second half of the concert a selection of first world war themed songs were performed, which also lightened the mood a little. In terms of the size of the event and the amount preparation time for us as performers, the two gigs couldn’t have been any more different. So what links these two very different performances, apart from TITCo? It was the reactions from the audience. The first performance helped heighten the experience for both Anita’s partner and their wedding guests. Likewise, performing the Armed Man was a very emotive experience with Karl Jenkin’s mass for peace combing with the poignant visual effects. When we had a chance to look out at the audience during the performances, I could see emotionally engaged people, either involved in the music or lost in their thoughts. Afterwards members of the group received lots of incredible feedback about how moved they had been by the event. It’s for this reason that these performances mean so much to me as a performer and make all the effort worthwhile.